Will Johnson was originally a 5th round choice of the Chicago Bears back in 1987 out of Northeast Louisiana. He’d be one of only 5 picks by the Bears that season- which included Ron Morris and Jim Harbaugh. A tweener at 6’4″, 245 playing linebacker, Johnson would play briefly in only one game his rookie season, but would be cut in 1988. 1989 would be no less fortunate to Johnson playing in New Orleans. He’d be cut out of camp as hamstring injuries would limit his performance. Will would sign with the Canadian Football League in 1989 and play for the Calgary Stampeders, quickly asserting himself as a wrecking ball of destructive force at defensive end. With great speed and gigantic wingspan, Johnson became the prototypical defensive end for players of that era in the Canadian Leagues. By 1991, Will was now a CFL All Star- an honor he held through the 1995 season. Will also won a Grey Cup Championship with the Stamps in 1992. In 1994, Johnson led the CFL in sacks with 17 despite double and triple teams, and in 1996 he’d be named to the Stampeders 50th Anniversary Dream Team. 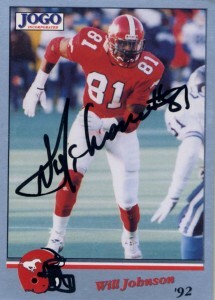 After his 1996 with the Stampeders, Johnson would play one more additional season with the Saskatchewan Roughriders before retiring after the 1997 season with 99 sacks. Since retiring, Johnson has used his long arms to become a member of law enforcement, where he is a constable for the Calgary Police Department. Will has spent some time coaching minor league football and also has delved into refereeing. In 2010 Johnson was also inducted into the Calgary Stampeders Wall of Honor.